Beautifully engraved certificate from the United States of Mexico (Estados Unidos Mexicanos ) issued in 1904. 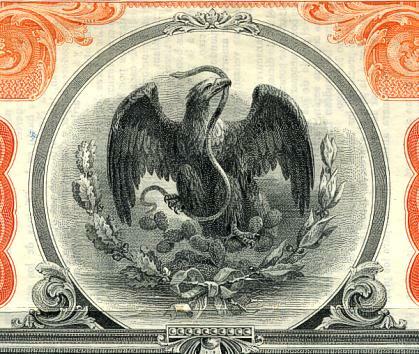 This historic document was printed by American Bank Note and has an ornate border around it with a vignette of an eagle holding a snake in its mouth. This item is hand signed by the Officals and is over 104 years old. There are over 50 unused coupons attached to the bonds not shown in the scan.